Well, this post is finally coming out of “draft” stage! This program happened in October! For this session we sang our block song, I read A Trick or a Treat? by Keith Faulkner, but not the whole thing. I skipped everything about Halloween, actually and just called them kids. Not a single person mentioned that they were trick-or-treaters. Then we played a guessing game with the book Whose Shadow Is This? by Claire Berge. They loved it and kept urging me to turn the page, turn the page! This was the first session where I put a lot more emphasis on PLAY. We know kids learn, like, EVERYTHING, through play and the program really works much better when it’s kids and grownups and kids and kids playing together with the tools we’ve given them. I emphasize the importance of making the activities fun. If they stop being fun, move on to another activity or be done. They can spend as much or as little time on an activity as they want. 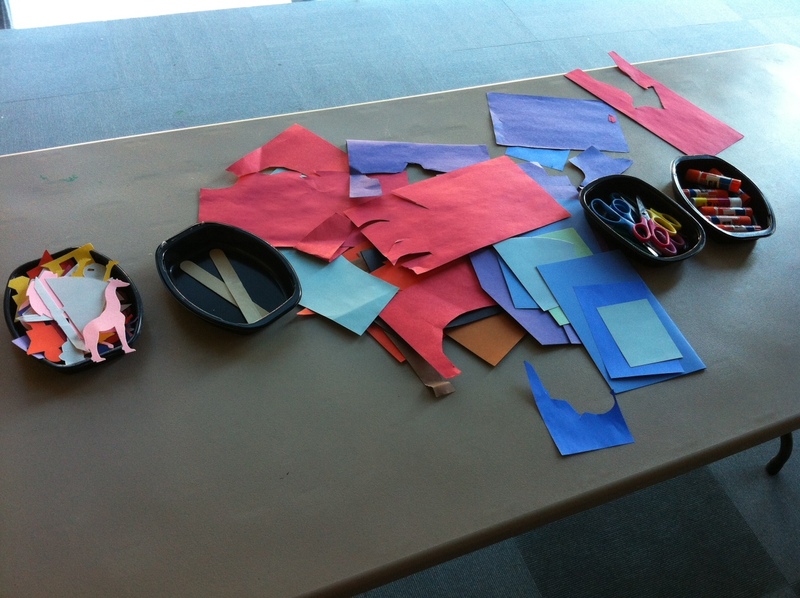 Most the ideas for this session came from the LibraryMakers blog. 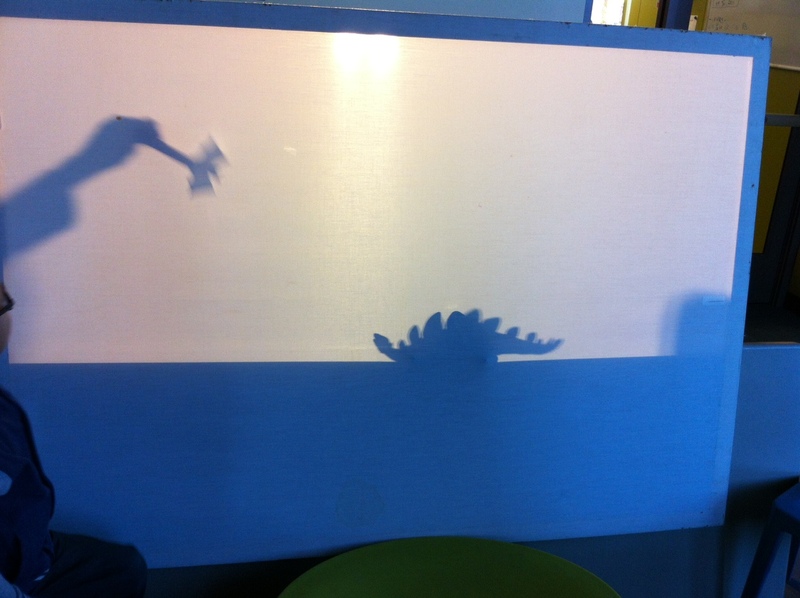 Use die cut shapes and scrap paper to create stick puppets for the shadow theatre. Had to be clever with setting this up to get the lights to shine through strongly enough. 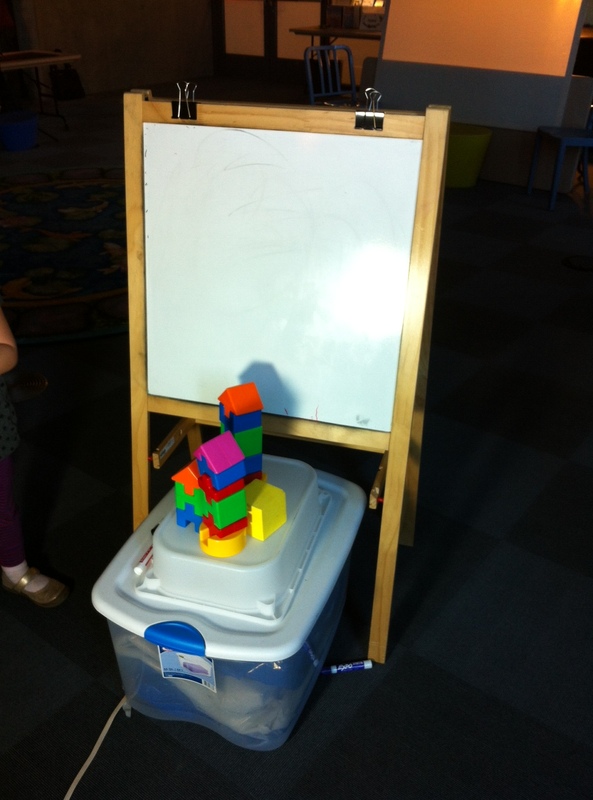 The kids had TONS of fun with this. And so did the parents. Behind the screen there was a bin of other objects like a plastic dinosaur (you can see his shadow below), pinwheel, stuffed animals, and more. 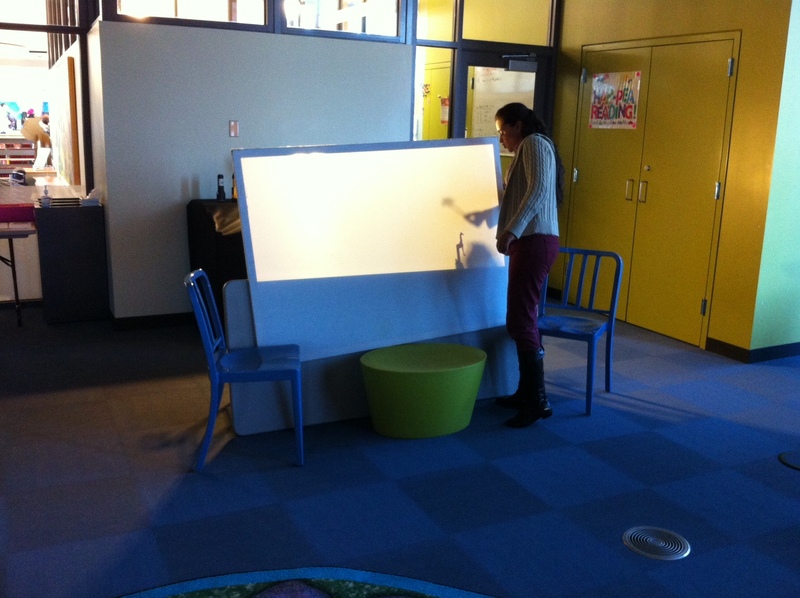 This gave them more ways to experiment with making shadows and some kids even made up short stories for their stick puppets and other objects. Happily, my husband has a ton of shop lights for his various college film projects so we were quite well lit! Of course, I didn’t get a picture of the girl who posed in a flight position with arms out and mom traced her. So adorable! 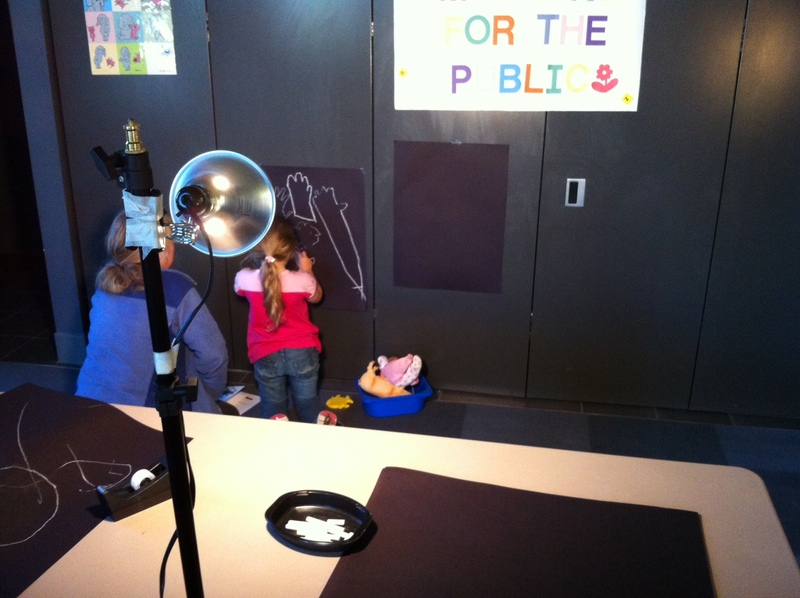 A lot of kids had their hands traced on the board instead of tracing objects. 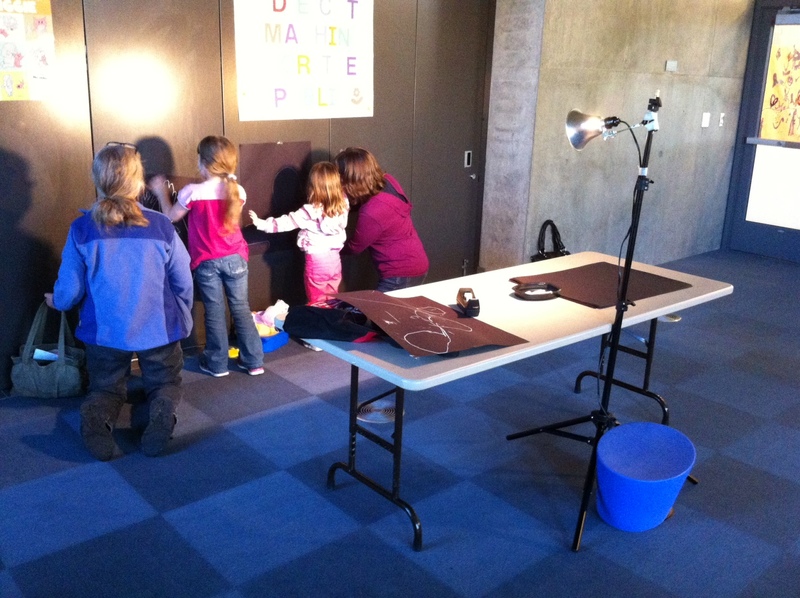 Shadow Puppet Theater is a nice idea for an activity. Where did you get the board by the way? Tracing their hands/arms on the board seems fun to do too! Sadly, I have no idea where the board came from. It pre-dates me. It is possible someone made it-it’s basically a white sheet stretched over a large frame, much like you would do when stretching a canvas. Glad you liked the activity! 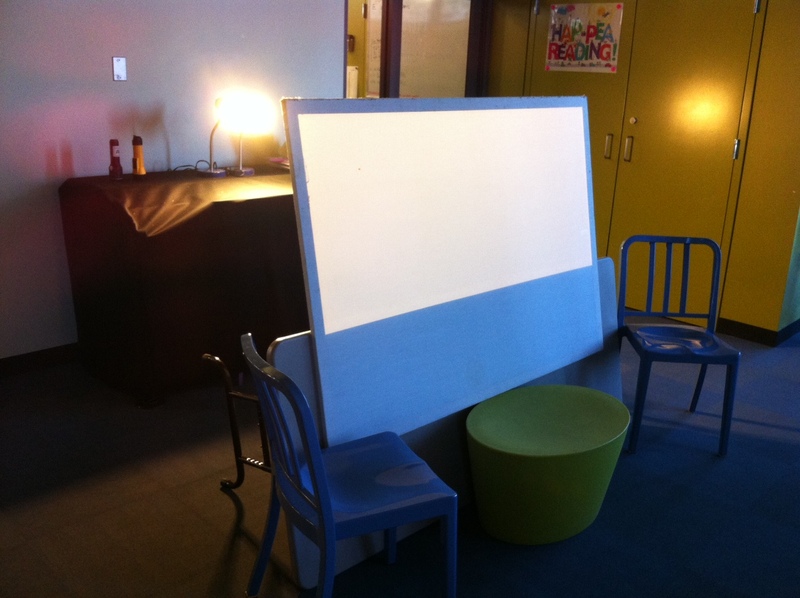 One of my co-workers has made a make-shift theatre using just a sheet or white paper stretched between two objects.